UK based manufacturer and supplier of pin badges. Metal lapel pin badges printed with your own corporate logo, sports club crest, or school crest. Choose from round, square, rectangle, shield, oval or star shape lapel pin badges. 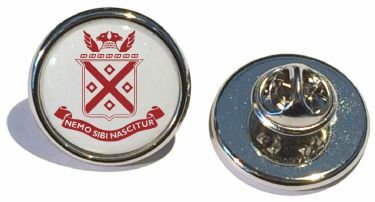 Replica enamel style metal pin badges for Schools, Colleges, Societies and Companies. Metal lapel pin badges printed with a corporate logo, with a sports club crest, or School and College crests. Pin badges in a variety of finishes, shapes and sizes, and with prices to suit all budgets. offer a low minimum of just 25 badges and supply your order in just a few days. We also offer great discounts on larger quantities. a stock range of club committee badge titles. 24 subject titles available in our range of badges for clubs, societies, special interest groups. Committee, Secretary, Treasurer, Helper etc. 100 subject titles in our range of badges for Schools and Colleges. Bar, shield, star and round shape badges supplied. - Presentation Shields. Wood shield with high relief resin mountings printed with your design, 5 different layouts available. your artwork and we will supply your order within seven working days. Order as low as 25 or 1,000's! We offer great discounts on larger quantities. - Cufflinks. Beautiful polished cufflink sets with your own design printed. Available in round, square, oval or rectangle shape. British and Irish surname crest designs. Click the 'Other Products' link for a full list of all the items we offer, or use the Search facility above.